This tutorial provides you with a foundation for working with Adobe Photoshop Elements tagging. It is the second lesson in the Adobe Photoshop Elements 10 Digital Classroom book. By tagging your images with ratings and keywords, you can quickly organize your photos and later locate just the images with the specific tags you are looking for. Film and photo paper are expensive, so in the old days of film photography, you had to be very selective of which pictures you took and even more selective of which ones you printed. But with the proliferation of digital cameras and large-capacity hard drives, the number of photos taken and kept has increased dramatically. It may be common for you to have hundreds or even thousands of digital photos of family and friends on your computer at once. How you sort them so that you can find the precise picture you are looking for, when you need it, becomes a challenge. Some people rely on multiple folders and subfolders with labels for the content of the photos and perhaps information about when they were taken. The problem with this approach is that it can take time to find specific images when you want them, and so the Organizer has a different way of approaching this task. 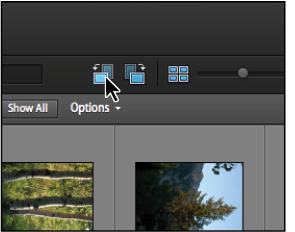 In Photoshop Elements, you can forgo multiple folders in favor of just tagging your images. We recommend that you tag and rate your photos immediately after you import them, while the subject or event is fresh in your memory. Creating this habit now will pay dividends many times over when you need to find your photos in the future. Photoshop Elements 10 adds enhanced tagging capabilities such as the Tag cloud that allows you to quickly view photos with a certain tag. In addition, Photoshop Elements 10 includes people recognition that makes it incredibly easy to find pictures of a certain person within images in the Organizer. To make it easier to categorize your photos, the Elements Organizer can be used to add star ratings to a photo. The star system runs from zero to five stars and you’re the judge of which images get five star ratings! 1 Press the Show All button and then select the redeye photo in the Organizer. 2 This image already has a five-star rating. 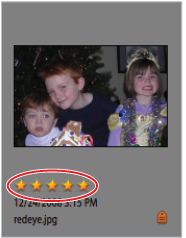 Change the rating to three stars by clicking on the third star below the photo. As you hover your cursor over the stars, they appear highlighted in yellow, if the image doesn’t have a rating. Click the fifth star to return it to a five-star rating. Set the star rating of the redeye image. In addition to being able to add a star rating to an image, you can add keyword tags to your images to make sorting and searching easier. Photoshop Elements already has a few keywords ready to use, and when you imported the photos, their keywords were also imported. Now you are going to make your own keywords. 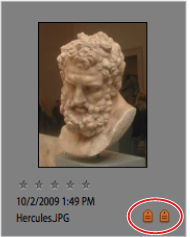 1 Click the Show All button in the Options bar and scroll down and select the photo named Hercules in the Media Browser. This is a photo of the head of a Greek statue located at the Metropolitan Museum of Art in New York City. Press the Rotate Left button ( ) located at the top of the Photo Browser to fix the orientation of the photo. Orientation issues can be quickly fixed using the Rotate Left and Rotate Right buttons. 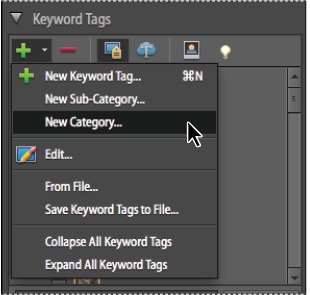 2 In the Keyword Tags panel on the lower-right side of the workspace, press the Create new keyword tag, sub-category, or category button ( ) and choose New Category. You can create new categories, sub-categories, and tags from the menu. 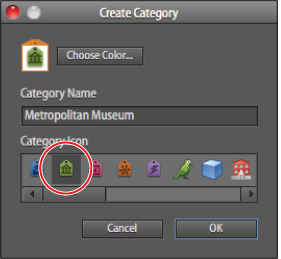 3 In the Create Category dialog box, type Metropolitan Museum into the Category Name text field and choose the green tag icon from the Category Icon section. Press OK. The category icon is simply a graphical representation to help you identify the category, you can choose any icon you wish. The Create Category dialog box. A new category is created in the Keyword tags list. Select the new Metropolitan Museum category. 4 Press the Create new keyword tag, sub-category, or category button, and choose New Keyword Tag. 5 In the Name text field, type Sculpture. In the Note text field, type Photos of artwork taken at the Metropolitan Museum of Art in NYC. To create a new sub-category, you must have a category tag selected. 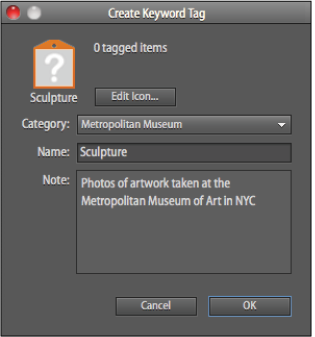 6 The new keyword tag is placed in the Metropolitan Museum category. Click and drag the new Sculpture tag over the image of Hercules, then release the mouse. The tag is now assigned to the image and indicated by the tag in the lower-right corner. You can add one or more keyword tags to any image. 7 Type Greek in the search text field at the top of the Photo browser. Click once on the image Greek Sculpture_01 to highlight it. 8 Press the Shift key and click the image Greek Sculpture_06 to select the images. 9 Click and drag the Sculpture tag to one of the selected images; notice how the tag applies to all highlighted images. Press the Show All button to show all images in the Organizer.